All Praise is due to Allāh, we praise Him, seek His aid and His Forgiveness. We seek refuge in Allāh from the evils of our souls and the evils of our actions. Whomsoever Allāh guides there is none to misguide and whomsoever Allāh misguides there is none to guide. I bear witness that there is none worthy of worship except Allāh, alone, without any partners and I bear witness that Muhammad (sallallāhu ‘alayhi wa sallam) is His servant and Messenger. The truest speech is the Book of Allāh, and the best way is the way of Muhammad (sallallāhu ‘alayhi wa sallam). The worst of affairs are the newly invented matters, for every newly invented matter is an innovation, every innovation is misguidance, and every misguidance is in the Fire. My brothers and sisters, there is a sūrah in the Qur’ān that we hear often. We recite it often and we read it from the mushaf often. It is from the first of the sūrahs of the Qur’ān that we teach our children. It is, therefore, befitting that we learn this sūrah and its benefits. That we understand its meanings, that which the Prophet (sallallāhu ‘alayhi wa sallam) said regarding it, that which the Sahābah (radhiyallāhu ‘anhum) reported and narrated on to the Tābi’īn, and that which was collected and recorded by the mufassirūn in their books of Tafsīr. And that sūrah, my brothers and sisters, is Sūratul-Ikhlās wherein Allāh (subhānahu wa ta’ālā) begins with the statement and the command “Qul” which means “Say, oh Muhammad”, or “Say, oh believer”. “He begets not, nor was He begotten.” Meaning: He has no children and nor was He born. “And He has none who is co-equal or comparable to Him.” Meaning: He has no female companion, and there is nothing that is comparable to Him. Imām al-Bukhāri reports from Anas ibn Mālik (radhiyallāhu ‘anhu) that he said: There was a man from the Ansār and he used to lead the companions in prayer in Masjid Qubā in Madīnah and he made it his practice to recite the Sūrah “Qul Huwa Allāhu Ahad” and he would recite after this Sūrah another Sūrah when he used to lead them in prayer. And he would do that in every raka’ah. So this sūrah was recited by that companion for that reason, that he loved it. And that sūrah was a cause for his admission into Jannah, and Allāh’s Messenger (sallallāhu ‘alayhi wa sallam) informed him of that. “Allāhul Wāhid, as-Samad, is a third of the Qur’ān.” (Sahīh al-Bukhārī, 5015) Meaning: that this sūrah, as he mentioned in the narration, is equivalent to a third of the Qur’ān. So the recital of sūratul Ikhlās in the nighttime is equivalent to a third of the Qur’ān. 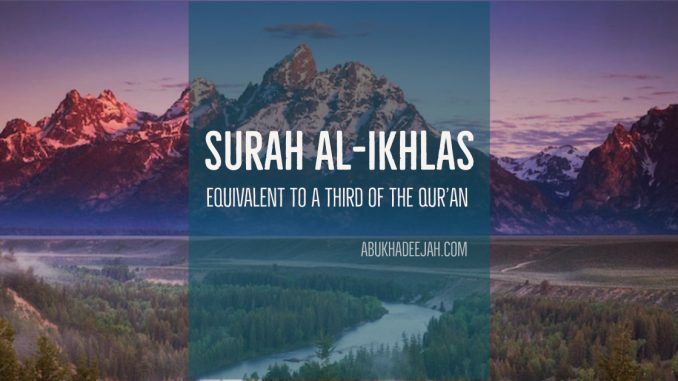 Sūratul Ikhlās holds that worth in the sight of Allāh (subhānahu wa ta’ālā) that He (subhānahu wa ta’ālā) considers it with you to be as if a person has recited a third of the Qur’ān. The Prophet (sallallāhu ‘alayhi wa sallam) would recite sūratul Ikhlās and he would recite it as a cure, as a Shifā’, just as he would recite many other sūrahs of the Qur’ān as a cure because the whole of the Qur’ān is a Shifā’, a cure. This is their worth, bārakallāhu fīkum. And this is the excellence and the virtue of these sūrahs of the Qur’ān. The saying of Allāh (subhānahu wa ta’ālā): “Qul Huwa Allāhu Ahad” – “Say, He is Allāh, the One”. With respect to just this one āyah at the beginning of this sūrah, Ibn Kathīr said: “Meaning that Allāh (subhānahu wa ta’ālā) is Wāhid, al-Ahad, He is One, He is Alone, having no equivalent (nadhīr), having no peer, having no minister (wazīr), having no rival (nadīd), He has none that resembles Him (shabīh), He has no equal (‘adīl). So this saying is not applied to anyone in an absolute sense and in an unrestricted manner, except for Allāh (subhānahu wa ta’ālā). Because Allāh (subhānahu wa ta’ālā) is Kāmil, Perfect in all of His attributes and in all of His actions.” Look at the Tawhīd in just this one āyah at the beginning of sūrat al-Ikhlās that Ibn Kathīr has mentioned here. May Allāh (subhānahu wa ta’ālā) give us Ikhlās of worship and give us the tawfīq to understand the words of Allāh (subhānahu wa ta’ālā). And the ‘Arabs would refer to the most noble amongst them as “as-Samad”. Abū Wā’il (rahimahullāh) said: “He, Allāh, is the “Sayyid”, He is the Master with whom lies the utmost glory, and honour, and high rank.” This is “as-Samad”. Everyone and everything in existence relies upon Allāh. Allāh (subhānahu wa ta’ālā) is not in need of them, rather, all of the needs of creation lie with Allāh (subhānahu wa ta’ālā). And Allāh (subhānahu wa ta’ālā) is the Master, or the “Sayyid” of all of creation, so He is “as-Samad”. Then, Allāh (subhānahu wa ta’ālā) mentions: “Lam yalid wa lam yūlad. Wa lam yakul-lahu kufuwan ahad”. That Allāh said: “He does not beget, nor was He begotten. And He has none who is co-equal (or comparable) to Him.” Meaning: that He has no son, He has no father, He has no wife, He has no partner, He has no female companion. Mujāhid (rahimahullāhu ta’ālā), the Tābi’ī, said: “’He has none who is co-equal to Him’, meaning: that He has no female companion.” So, Allāh (subhānahu wa ta’ālā) has no partner. Allāh (subhānahu wa ta’ālā) has no parent. Allāh (subhānahu wa ta’ālā) has no children. Far removed is Allāh (subhānahu wa ta’ālā) from that which the polytheists ascribe to Him. Rather, it is the creation that comes to Allāh as an ‘abd (subservient slave). Not that Allāh (subhānahu wa ta’ālā) should take a son. Everything in existence is a servant and a slave of Allāh (subhānahu wa ta’ālā). This accusation that the Christians almost as a whole, and a group of the jews make against Allāh, that Allāh (subhānahu wa ta’ālā) has taken a son; then the heavens are about to tear apart, and the earth is about to cleft asunder, and the mountains are about to fall in devastation that they should accuse Allāh (subhānahu wa ta’ālā) of taking a son. Neither does Allāh beget and nor was Allāh (subhānahu wa ta’ālā) begotten. There is no one more patient, my brothers and sisters, than Allāh in the harm that He hears against Himself. That they revile Him, and that they belittle Him, and that they say about Him that which is not befitting His Majesty: that He has taken a son! Allāh (subhānahu wa ta’ālā) is not pleased with them that they should say that. That they ascribe to Him a son, look at the patience of Allāh (subhānahu wa ta’ālā). Allāh still looks after them, Allāh still provides for them. And Allāh (subhānahu wa ta’ālā) revealed to them the Book through the Messenger Muhammad (sallallāhu ‘alayhi wa sallam), the Qur’ān, wherein Allāh (subhānahu wa ta’ālā) falsifies their claim and informs them of the falsehood that they ascribe to Allāh (subhānahu wa ta’ālā), that He has begotten a son. Imām al-Bukhārī reports from Abū Hurayrah (radhiyallāhu ‘anhu) that the Prophet (sallallāhu ‘alayhi wa sallam) said that Allāh (subhānahu wa ta’ālā) said in the hadīth Qudsī: “The son of Ādam lies against Me (or he disbelieves in Me) and he has no right to do so.” And Allāh said: “He reviles Me and he has no right to do so. As for his lie against Me is his saying that I cannot resurrect him… whilst the first creation is not easier than returning it back to life.” So they lie against Allāh: that Allāh (subhānahu wa ta’ālā) can not resurrect them. So Allāh (subhānahu wa ta’ālā) informs them that the resurrection is not harder than the first creation. As is known: creating something from nothing is not easier than resurrecting that which was already created. So, they lie upon Allāh (subhānahu wa ta’ālā), that they say that Allāh will not resurrect them, even though Allāh (subhānahu wa ta’ālā) created them in the first place. So that’s the lie that they invented against Allāh. Then Allāh said: “…As for his revilement of me is that they say that Allāh (subhānahu wa ta’ālā) has taken a son. And I am “al-Ahad” the One, and “as-Samad” the self-sufficient Master upon whom all of the creation relies for their needs.” (Sahīh al-Bukhārī, 4974) Meaning: I am the One who answers the needs of all of creation, I am their Master. They are the ones who have to turn to Me for everything. So Allāh (subhānahu wa ta’ālā) informs them with this hadīth Qudsī that He is “al-Ahad”, that He is “as-Samad”. He was not born from anything nor does He beget (give birth or have children). So then Allāh (subhānahu wa ta’ālā) said: “And there is no co-equal to Me” Meaning: there is no one who came before Me, and there is none that I have taken as a child. And that there is none who is equal to Me, neither a wife and nor other than that. So this hadīth Qudsī, bārakallāhu fīkum, are the words of Allāh that He revealed to His Messenger (sallallāhu ‘alayhi wa sallam). This sūrah, my brothers and sisters, has in it the Name of Allāh. The greatest Name of Allāh is contained within this sūrah, as some of Ahlul ‘Ilm have said. In it is a Name of Allāh such that if you were to call upon Allāh by way of it, then Allāh will give you what you have asked for. And Allāh will answer the du’ā’ that you made to Him. This is sūratul Ikhlās and the last two sūrahs of the Qur’ān, al-Falaq and an-Nās. That you are to recite them, you are to pay attention to them and they will protect you by the Permission of Allāh (subhānahu wa ta’ālā) because they are the words of Allāh. Look at the greatness of sūratul Ikhlās. It is not sufficient that just one talk is given to explain this sūrah. This was a small insight into the tremendous nature and the tremendous benefits of this sūrah that much of the Ummah recites but they don’t know what they are reciting, they don’t know the meaning of what they are reciting. So learn it, my brothers and sisters, learn the meanings of it and recite it alongside sūrat al-Falaq and sūrat an-Nās three times when you awake and three times in the evening. And recite the sūrahs al-Ikhlās, al-Falaq, and an-Nās into your cupped hands after you have blown into them before you go to sleep and repeat this three times and rub your body with your hands. Take benefit from this sūrah for indeed, it is equivalent to a third of the Qur’ān. May Allāh (subhānahu wa ta’ālā) give us tawfīq and guide us to understand the Qur’ān and the tremendous words of Allāh (subhānahu wa ta’ālā) to benefit from them and to understand them and to act upon them and to meet our Lord with Īmān in them. Walhamdulillāhi Rabbil ‘ālamīn, wa sallallāhu ‘alā nabiyyinā Muhammad wa ‘alā ālihi wa sahbihi ajma’īn.